All Gargoyles characters the property of Disney and Buena Vista Television. 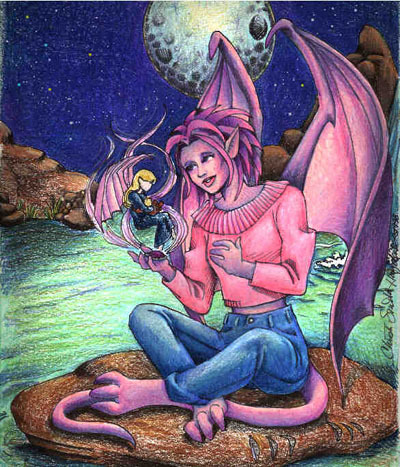 All original characters and plots copyrighted 1998 by Christi Smith Hayden. premature hatching and part-human nature had made his development slower. pushing her siblings away and scolding them loudly when their play became too rough. words, that's what Moraine is destined for." gargoyles at play. "She's a good baby-sitter, that's for sure." on the yellow legal pad in front of Avery. "Now where were we, lass?" Schwarz with Owen and Alex tomorrow." "I dinnae think we've forgotten anything." are you going to do?" rolled her eyes and laughed at him. Macbeth had long since settled back into his Brooklyn Heights residence. soul so that she would know had deeply she had injured Demona's pride. to wince. "Lookit! That's what we need to get for Austin and Omaha!" "Why, Alex! That's perfect!" She hugged the boy up against her hip. "You've been such good help today." got it in the form of the bespectacled blonde man striding up to them. and Miss Bishop in this crowd." isn't that the pot callin' the kettle black, hmmm?" "Nana?" Alex askedin his piping little voice, "Do you still love me?" "That's a silly question, Alex. Of course, I love you." "Just as much as Omaha an' Austin an' Morrie?" There was anaudible pause. "Well, Crim's a little different now, isn't he? of all the other things she likes?" an' now you got lots more." sight of Alex being swept up into a big hug. don't want to miss a moment of it." around his mother's wrist just to add to the difficulty factor. laugh more. She snagged his three-toed feet and gave them a noisy bzrrpt. baby years for a long, long time." gargoyles had yet to learn the fiercesome poses of their elders. frowning back with her hands on her hips and her chin jutting out. beast let her pet him, his hindquarters raised and tail froze in mid-wag. baby-sitter and guardian that was always ready to play. Castle Wyvern greeted the longest night of the year with vibrant roars. scratched his belly, imitating his uncle Broadway without realizing it. she had since her hatching days. "Iz name Hud-son," Omaha said sourly. She and Austin rolled their eyes. Austin's wide blue eyes. "'Appy Sol-tish," hesaid somberly. Avery rewarded him with a sunny smile and sank down to give him a hug. the baby's brow with a careful finger and Crim burbled happily in return. careful to praise the other children when she had Crim in her arms. had little spells of jealousy to be worked through. courtyard. "I've got a big Solstice hug for two lucky gargoyles!" them and held them tight. braid. "Somebody wants your attention." have fun tonight, won't we, bud?" castle. "Goliath says it's time to start!" Bronx started shepherding the hatchlings inside. are liable to get real festive." "That a threat or a promise?" the Hatchlings' excited squeals echoing in the Great Hall. A single drop of the purest oil floated on the surface of the spring water. sky. Demona smiled coldly at it. She turned back to her enchantments. Dark Spirits, grant my boon!" from the common rock as she focused all her powers on it. setting that Avery could have ever hoped for. "I can't possibly imagine why." Tina laughed and handed her a small box. give this to you tonight now." and held it to the light. "Well, well," she murmured, "welcome home." really should have passed it back a long time ago." heart. "I think family heirlooms make the best gifts. Thank you, Tina." the light catching on a bright sparkling something on her left hand. at the end of the jaunty Santa's hat his father was wearing. many eggnogs have ye had?" "Not nearly enough!" Brooklyn answered back amiably. between thumb and forefinger talons. "And the lucky winner is.... Avery!" goodies!" She examined it closely. "Hmmm, doesn't say who it's from." She rattled it and narrowed her eyes speculatively. "Could be jewelry." "Well, don't just stand there!" Angela called as she helped Broadway. urn filled with hot cider. mouth while she tried to open the box. "Boy, this lid's on tight!" --and an electrifying nimbus of explosive combustion surrounded her. The box fell to the floor. the smooth oval stone clenched tight in her fist tingling like a live wire. wings and catch the wind but she found herself falling. The ground came rushing up at her faster thanshe thought possible. feet and smelled of summer. were late going up to the lake or I would have never seen you falling." curious gray eyes tinged with purple as he puckered up his beak to speak. "Crim?" Avery stared at him in horror for a few seconds. Then she fainted dead away. "Where did she go?" Brooklyn demanded as Crim wailed in his arms. package when it arrived earlier." that she had bought something for Alex to give Ms. Bishop." "Is there anyway you could find out who sent it?" Goliath asked. "I hardly think the usual resources will work in this instance," Owen said. perhaps Alex and I can use this opportunity for a magic lesson." Alex looked up from his perch on Fox's lap. "Unca Puck?" my boy. It's time you learned Magick Sniffing 101." gestured and the empty pasteboard box levitated towards them. certain signature behind. The trick is to see without seeing." dream image. We're going to find it. Ready?" box. Do you see a faint glow around it?" "Red." He frowned. "Ugly red. I don't like it." take a shape. What does it look like?" Alex squinted and leaned forward. "It's fuzzy, I can't see it's face." "That's all right. Tell me what you can see." around it." His eyes widened. "An' it's got a tail." them drape over her body. A black look crossed Angela's face as she shot a quick glance at Goliath. "Mother," she said bluntly. "Mother's behind it." gargoyles to be as one on this night." wonder that she hadn't retaliated sooner." I to the Nightstone building." sometimes your temper gets the best of you." her rookery mates with a half angry, half upset look on her face. Demona wise enough not to mix magicks like that." "Is that bad?" Alex asked wonderingly. "We will see, my boy, we will see." Voices wafted in and out of the fuzzy gray void. looked like her, but I never thought ...."
sounded a little like Brooklyn, perhaps a little more tenor and smoother. "Yeah, Robyn went to fetch him." what happened? Where am I?" Eagle Lake when we saw this bright light in the sky and saw you falling." baby. "I guess I gave you a bit of a start, huh, Mom?" how much to tell you." straighten this whole mess out." Crim cocked one brow ridge sarcastically at her and snorted. not an only child, are you, Crimmy?" brow ridges and then Harley's. "I always wanted to have a little girl too." Harley was flustered. "You think I'm pretty?" hands. "Honey, I think you're beautiful. Don't let anyone let you different." and away from those hoverbikes, you clean up real nice." grow a beak or not." brother and laughed. "Crim? Old snoot-by-the-foot?" "Knock it off, dread head." "Kids!!" Avery said firmly, "Both of you, behave yourselves! Play nice!" of the clan?Are they here too?" "Well, of course they are!" Harley started ticking off on her talons. Robyn, Samson, Gwennie, Bethany, Tahlequah..."
you tell her too much now, y'hear?" his haunches and crossed the room in three steps that were almost leaps. Avery glanced at Harley. "Robyn?" arms. "You sound like a broken record." and fetch the others? I expect they'd like to visit with Avery too." through the house and ending with the bang of the screen door. green. "There's someone who wants to see you if you're up to it." her dress. "Yes, of course." She looked up and froze. been with her earlier in the evening and it chilled her to the bone. this some sort of illusion? If it is, I don't appreciate it at all." "Dad," Crim began, "don't you recognize her? It's her, it's really her." beaked face away from them. and smiled. "You kept the braid." remember what we did after that, hmm?" him in a tight embrace. "Oh, Avery! I thought I'd never hold you again!" Burying his face in her hair, he let go of long pent-up tears. "Dad?" Crim called cautiously. "Mom?" space." There were sounds of the room clearing and then the door shut. worst was over for both of them. up, I'm going to scream." "What's the last thing you remember before coming here?' he asked softly. big flash of light, and then I was here, falling from the sky." "That's all?" Brooklyn frowned. "I'm sure there must something else to it." chestplate. "And what's with the armor?" eyes said what he couldn't. He shook his head. "I just couldn't do it. It would've been like letting you down." A tear ran down the curve of her cheek. "I'm so sorry." Avery knew so well. "I guess wishes do come true sometimes, huh?" settled his son into a more comfortable position in the crook of his arm. of hysterics. A muffled sob escaped but Crim kept sleeping. with an afghan when she paused and turned her head in his direction. "Who's there?" she asked softly. "I have to," he answered. "I can't just stay here and do nothing." looked their way. Avery tightened her grip on Brooklyn's arm. Avery with large eyes the color of robin's eggs. "Happy Solstice, Nana." "Austin?" Avery touched his face wonderingly and he nuzzled her hand. "Oh, Austin! How you've grown!!" Brooklyn snorted. "We thought he would never STOP growing." always think of you as being bigger." swallowed up in the tree trunks that were Austin's arms. a bronze buckle -- a strange-looking accessory until Avery recognized it. goes straight to Miz Kitty's head." each other and then at her and laughed. all the time and they love it." Avery started to grin. "You don't mean---"
bad-tempered, pointy-eared little thing with hairballs but she's mine." males big and dumb, you big goober, you." He laughed and lifted her up for a kiss. been waiting to meet you." she contemplated her deeds over the past years and those yet to come. The French doors on her balcony crashed open. come visit me tonight. Happy Solstice, daughter." properly tonight of all nights?" Angela took a deep breath. "A good Solstice to you, Mother." contemporary builders of this place didn't construct it with him in mind." where I can see you." you always do, Demona? This isn't like you." incriminated her more than any confession. you, Mother? You were the one that sent that gift to Avery." "And how is the little half-breed? Still crying her little eyes out?" Broadway and Angela glanced at each other. "Mother?" Angela said carefully. "That's not exactly what happened." "There's something screwy going on here," Broadway muttered. mildly. May I see that stone?" laughter was cruel and mocking. Angela pursed her lips together. "That's presumptuous, isn't it, Mother? Every spell has a counterspell, the Magus said so." wine. "Do come back again." Brooklyn intercepted them less than a mile from Demona's house. "Well," he demanded. "Was she there?" better part of a wineskin. She's beyond caring about anything tonight." "Why, I'll---" Broadway caught Brooklyn before he could get away. "But," Angela continued, "the spell didn't do what it was supposed to. Something went wrong and we need to find out what." Avery hardly wanted to close her eyes for a second. her, however, was fascinated and intrigued. "So many new faces," Avery said to Brooklyn and Moraine. Goliath and Elisa, there's been others to fill their places." to hatch in the rookery now." on the far side of the crowd. Brooklyn followed her glance. "So, what do you think of her?" guessing I wasn't there for her birth." against the top of Avery's head, "and she's got your good looks." archly. "I'd say we've done good, darlin'." "Yeah." Brooklyn hugged her shoulders. "I guess we have." the stomach. "There really is food left. He didn't eat it all." calling you 'Aunt Avery' since you and my mother are related." faded denim jeans and a Stetson cowboy hat. "Good gravy," Avery commented. "It's the Lone Star Garg." started coming by to visit." Harley giggled. "Especially if he knows Moraine's here." the while trilling, "Avalon!! Avalon!! Avalon!!" "What are you going on about, BlueBonnet?" Rowdy asked irritably. "That's no way to behave!" time to take them where they need to be." "And I've got proof of Avalon's involvement." realized he was a Xanatos of another color. "Alex." Avery bit her lip. hair. "It's good to see you again. How are you holding up?" don't know how I got here or why." waiting for you to show up in New York, not out here in Texas." to the bonfire to read it. the note and the envelope into the fire. "Brooklyn?" Her voice sounded very small in the unnatural stillness. white hair. "If I don't, she'll never be born." "I thought as much," he whispered back with a sobbing catch in his voice. trade your life for hers." beloved. Don't worry about leaving me behind. I'll be fine." said things more profound than mere words could convey in a lifetime. for will grow up to be healthy and happy and I can see that y'all have." going to be all right." cosmopolitan veneer drop just enough to sweep her up in his arms. nanny," he murmured in her ear. "Thank you, Avery." squeeze. "You're still the number one kid in the castle." even just a little while has made this the best Solstice ever. I love you." face, "--now I won't get to know you at all!" drop of blood fall on the amethyst gemstone. So the bloodline changes through chance and whim. To become She Who Holds The Stone." with a glorious light, lighting the faces of mother and daughter. Harley's pink sweater. "On this night of giving, I deliver your birthright. "Even you?" Harley asked, wonderingly. Robyn and Alex both gave it a closer look. "A lodestone?" Robyn asked. "Looks like it," Alex agreed. "Do you suppose it's still holding a charge?" Avery cocked an eyebrow at them. "Huh? What are y'all talking about? gentle as a leaf blowing in the breeze, she was swept away. anxiously. "I hope he doesna do anything rash." "Brooklyn's not the same reckless youth since he became Avery's mate,"
Goliath rumbled. "Still, perhaps Lex and I should go after him." been talking quietly with Tina. "Here he comes with Angela and Broadway." down. "Well," Goliath asked, "was Demona responsible?" and she did cast a spell on it but something went wrong." just make Demona undo the spell?" right now. Drinking and magic is a bad combination." legends," the clan leader said. "They had just opened their presents." "Presents!" Tina yelped. "Omigosh! The Memory Stone!" "What was that, Miss Harris?" Owen inquired smoothly. Avalon's magic when we examined the gift box." you mean? Where is my mate?" and Alex could use it to bring Avery back." "Do you have it with you?" Owen asked sharply. "Yes." Angela reached into her belt pouch and retrieved it. "Here." spheres touched, they shattered into an effervescent shower of stardust. "Oh, thank heavens, I'm home!!" "Avery!" Brooklyn wrapped his wings about them both. "It's all right now. have it. This is Solstice Night. All gargoyles are one, remember?" a spell to hurt you. What if she tries it again?" had poisoned Elisa when in fact, she had failed?" motorcycle! What were you thinking?" in his arms, "I promise." Momma gonna buy you a mockingbird. Momma gonna buy you a diamond ring..."
watched the morning sun crawl up her bedroom wall. prospered and that there were new generations waiting to be born. remembering what a handsome fellow her adult son had been. settled him on the rag rug in the corner of the room. my children live and in that, I am happy. can, 'cause it's gotta last a long, long time." Yawning and stretching her wings, Avery leaned back against her pillows. "My, I'm so sleepy all of a sudden. I'll just rest my eyes for a bit." retrieved the envelope laying mere inches from Avery's curled fingers. Reading the inscription on the envelope, Owen's right eyebrow went up. should send this courtesy of the Illuminati post." Owen tucked the envelope in his pocket and quietly left the room. sneaking away from the Solstice party and for that Harley was grateful. unexpected events, this was one time that she really needed to be alone. mother more at that moment than she thought possible. almost thought she could see something flickering in its depths. voice, complementing the simple lullaby with a thrumming counterpoint. the pale pink sky above her. Harley's smiling stone face was glorious.